Why Book Your Destination Wedding with Enchanted Travel? Home > Uncategorized > Why Book Your Destination Wedding with Enchanted Travel? 10 Jan Why Book Your Destination Wedding with Enchanted Travel? At Enchanted Honeymoons Travel, we pride ourselves on being the experts in destination weddings and honeymoons. We plan hundreds of destination weddings and honeymoons each year. Not only do we have expertise in planning these big events, but we also make it a priority to visit all of the most romantic destinations so that we can give you first-hand information and opinions on the properties you are interested in. In addition to our knowledge and travel experience, there are several other reasons to book your destination wedding or honeymoon with us! The best part about using an Enchanted Honeymoons Travel agent is that we take care of all your guests’ bookings. This means that you avoid the responsibility of being the travel agent and can focus on being the bride and groom. We can provide flights and service from anywhere in the world, so even your out-of-town guests can work through us. We handle everything, so you can enjoy your big day. From the moment you and your guests book with us, you will have access to our 24-hour support. We offer support before travel (for example, if your flight gets canceled and you need to rebook), during travel (if you or your guests run into any issues while in the destination), and after travel (if you misplaced an item at the hotel and need to file a lost and found report). No matter the day of the week or the time, you will be able to reach one of our agents for assistance. For both destination weddings and honeymoons, we offer free gift registries. This allows your friends and family members to purchase gifts for your destination wedding or honeymoon, or to contribute a dollar amount to your trip! 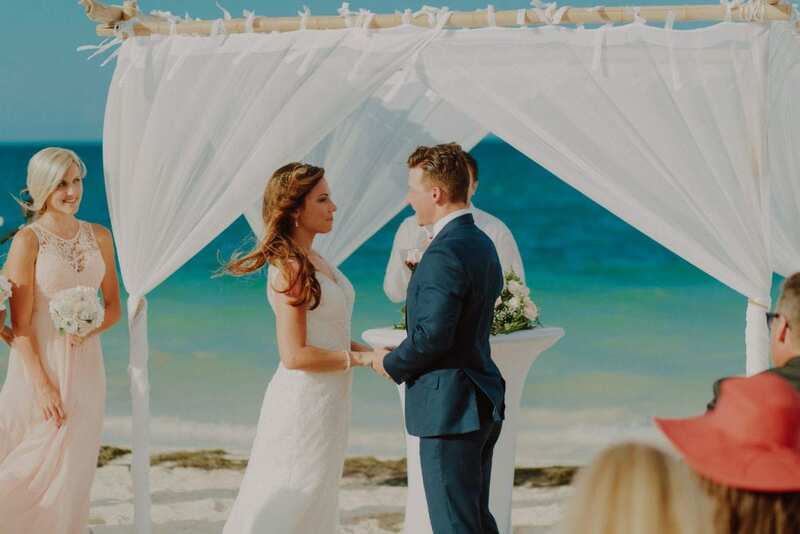 From candlelit dinners on the beach to couples massages, anything you imagine for your trip can be added to this registry free of charge. If you find a great price somewhere else, but still want to book with Enchanted Travel, we offer a price match service. This service allows you to get the lowest apples-to-apples price, guaranteed, but with the added bonus of working with the specialists at Enchanted Travel! At Enchanted Honeymoons, most of our bookings are secured as a package. This means that your air, hotel, airport transfers, entertainment, and taxes are all quoted to you in one price. Booking as a package rather than as separate components makes it less complicated for you at the best price. Interested in learning more about our destination wedding services? Call us today at 402-281-3022 to speak with an agent!